TINIAN, Northern Mariana Islands - A little more than 74 years ago, Seabees fought along side U.S. Marines in the battle for the Mariana Islands chain during WW II. Fast forward to today, Seabees’ are now fighting a different battle on the same island they liberated in August of 1944. Super Typhoon Yutu, a category five cyclone, made landfall on the Northern Mariana Islands causing devastating damage, October 25, 2018. Soon after, U.S Navy Seabees were deployed to Rota and Tinian to aid in the immediate life-saving search and rescue operations. A few months have passed, operations have moved to mitigating property damage and repairing roofs. Residents of Tinian continue to look forward to the Seabees’ help in getting back to a sense of normalcy like they had before Yutu struck. For one Seabee, being here on Tinian in support of the recovery efforts has a special, personal significance. When Nicely found out that he was coming to Tinian in support of recovery efforts, he called his grandfather and relayed the news. Both were excited to share a place where there is a deep history of Seabee pride. Nicely has only been on the island for a few days but has noticed how generous and kind the people of Tinian are. “With Yutu hitting the island and causing so much devastation, the Seabees being here helps the community out with our ability to fix roofs and clean up debris and they are really appreciative of us being here, helping them get back to normal,” said Nicely. While surveying the island, Nicely couldn’t help to think about his grandfather and how life was back when the island was a major U.S. military hub during WWII. Nicely, and his fellow Seabees here with him are excited and eager to get to work helping Tinian recover from Super Typhoon Yutu. When Nicely returns home, he plans to share more of his experiences with his grandfather and talk about how Tinian was and how it is, but most importantly how they now share a common experience as Seabees serving on this special island of historic significance. NMCB-3 is forward deployed throughout the Indo-Pacific region and United States ready to support major combat operations, theater security, humanitarian assistance and disaster relief operations. 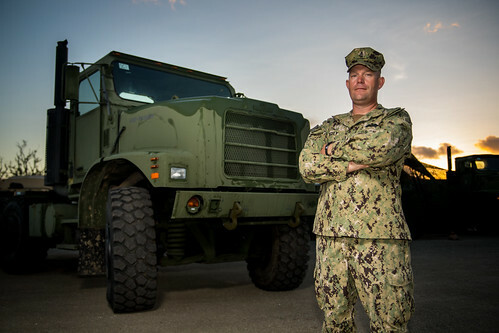 Seabees provide general engineering and civil support to Navy, Marine Corps and Joint operational forces globally.